Entry-level zero turn mowers devour sprawling expanses of turf without breaking the bank. More importantly, they maneuver around obstacles - like trees, shrubs and flower beds - much easier than a lawn or garden tractor. This will determine how large of a cutting deck you'll need. Deck size refers to the width of the cut. The wider the cutting deck, the faster you will be able to mow your lawn. Sometimes bigger isn't always better. The biggest challenge for a zero turn mower is fitting through narrow spaces. How many trees you have to mow around, and the space between your swing set and flower bed are the kinds of factors that will determine the right size for you. A smaller mower deck (42" or less) will make maneuvering through and around those obstacles much easier. However, if your property is reminiscent of the Great Plains with lots of wide open spaces, a wider deck (46" or more) will get you out of the sun and back to the comfort of your home that much quicker. If your property is surrounded with a fence, keep in mind that your mower will need to fit through the gate. Measure the width of your gate and make sure that the mower deck size you choose is small enough to comfortably maneuver through the opening. For those who aren't comfortable with steering zero-turn mowers with lap bars, there is a steering wheel option. Steering wheel models also benefit from enhanced stability on hills and slopes. The front wheels on these models are controlled by the steering wheel, unlike traditional zero turn mowers that have caster wheels that move independently. The steering wheel works just like a tractor's, and it has an adjustable column. 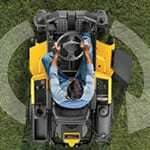 This more familiar steering method will allow you to easily adapt to your zero-turn mower, and will help to prevent turf scalping. Although the steering is different than the traditional zero-turns' lap bar design, you still get the benefit of turning on a dime. Entry-Level ZTR Lawn Mowers - Find Out How to Pick the Perfect Entry-Level Zero Turn. Our lawn mower how-to library can help you pick the perfect reel lawn mower, push lawn mower, riding lawn mower, zero turn lawn mower, lawn tool or lawn mower accessory.